Our Monogram team in New York City has the pleasure of working with Kris from Driven by Decor. After months of dreaming and planning, Kris finally kicked off her kitchen renovation last month. As she says, “It’s definitely an it’s-going-to-get-worse-before-it-gets-better situation since we’re demoing our kitchen down to the subfloor and studs.” On her blog Kris shared some plans for her kitchen remodel, including the appliances she selected. We might be biased but we think appliance selection is one of the more enjoyable components of a kitchen remodel! We came across this kitchen remodel and just had to share … take a look at this post from Kitchen Design Partners. As we shared back in September, Monogram is the proud sponsor of the Boulevard Show House in Houston, Texas, in collaboration with Laura Umansky. You can learn more about the announcement here and read our interview with Laura here. Earlier this week the Laura U team talked with Alexandra Skobel, Monogram Designer Engagement Leader – Central Region, about Monogram appliances and the new appliances soon to be featured in the Boulevard Show House kitchen. Read the interview here. Just wait until you see this vent hood in the Boulevard Show House kitchen! As you may know all too well, remodeling projects take some serious time and then shift into super-speed. There are lots of exciting updates happening at the Boulevard Show House now! Check out The Boulevard Show House website and Facebook to stay up-to-date on all the progress updates and exciting announcements. Initially clients Adam and Sarah came to Ember & Brune because they were having a difficult time finding their forever home. Adam and Sarah were moving from Chicago to the suburbs and had trouble finding everything they wanted in a home. They decided to buy a home and remodel it, and hired Ember & Brune. The firm looked at the house before Adam and Sarah closed on it and came up with a plan to add an addition, while also reconfiguring the existing space to make this historical house everything they wanted in a forever home. All while being budget conscious. As a full-service Design – Build firm, Ember & Brune designs the project, builds it and even provides interior design services to help furnish it! Take a look at the final reveal Ember & Brune blog post as well as the intro and in progress posts. We interviewed the team at Ember & Brune to learn a little more about the project. SRFD: Any surprises on this renovation? Ember & Brune: Endless. We were gutting the existing interior and adding an addition on a home that was built in 1910. Some things we found behind the walls were fun and interesting, like Saturday Evening Post magazines used as insulation and perfectly preserved. While others were scary like old electrical and gas lines that were still live and never properly disconnected and disposed of. SRFD: What component of the project are you most proud of? Ember & Brune: While it is impossible to pick just one component, I will say we are very pleased with the coffered ceiling in the kitchen. When our architect told us we could not open up the first floor without a hefty beam running down the middle, we decided to get creative. We designed the coffered ceiling to completely conceal the beam while adding an architectural detail in the kitchen. We tried to stay true to the home’s historical charm. The coffered ceiling has added so much character to the space. SRFD: Tell us a little about the kitchen. Ember & Brune: The clients like to entertain so a large kitchen was a must. The island is perfect for entertaining and comfortably sits their guests on the opposite side of their kitchen’s main cooking hub. We are so excited to announce that Monogram is partnering with interior designer Laura Umansky and her husband Michael, who are renovating a home in the Boulevard Oaks neighborhood in Houston, Texas. In collaboration with the Laura U design team, Luxe Interiors + Design, Preservation Houston and others, the Boulevard Show House will be quite the story to follow! Learn more and follow along on Laura’s blog. Following up on last week’s profile of designer Nancy Blandford, we’re including Nancy’s story of her most recent kitchen remodel. My clients had just purchased this wonderful lake house. The kitchen, dining, and living spaces are open and face the lake. The new owners requested an update to get rid of the orange woodwork, the faux painted sky ceiling, and all the murals and painted tiles. They also questioned the “why” of the angles on the existing kitchen. The home had been remodeled in the early ’80s. I was pretty sure it was just a designer being clever since nothing else in the home was angled. Since the kitchen is the backdrop of the living and dining room, the room needed to fit in without dominating. I was able to straighten out the angles. We kept the existing pantry and hid the refrigerator/freezer behind cabinet doors by using two 30” Monogram appliances side-by-side framed by ovolo posts. The 48” Monogram range and hood were centered on the wall space that remained. On either side of the range are wide, deep drawers. The island is home to a Monogram microwave drawer (hidden on the back side of the island), pull-out trash and recycling bins, a Native Trails curved farmhouse sink, a cabinet front dishwasher, and large, deep drawers for dishes. The backside of the island is raised with furniture-piece cabinets on both ends and four wide, comfy stools tucked into the center. The island cabinets were painted a custom blue with black brushing. The remaining cabinetry was painted white with a pewter highlight. We took the existing hutch space and made it into a dry bar with leaded glass doors above and a Monogram Bar Refrigerator. We used a honed onyx white quartz countertop with an ogee edge. The ceiling was painted a deep navy and glazed with silver. In the center of the raised ceiling, we hung a chandelier that when lit, makes the ceiling glow. And for the finishing touch — what I like to call the jewelry — we used polished nickel oversized handles and a polished nickel bridge faucet. Hear from California homeowner Chris Cory about her first Monogram kitchen remodel, and why she is anxiously awaiting completion of her second Monogram kitchen remodel in another home. “We are eagerly waiting for our new kitchen to “appear” in about 10 weeks. About six years ago we remodeled our kitchen in Oakland, California, with three Monogram appliances (48″ range, refrigerator, and microwave). We sold our home in Oakland and the beautiful Monogram kitchen was the main selling point. We moved to Pacific Grove, California, and purchased a great GE Cafe double oven range thinking we would use it in our “soon to be remodeled” kitchen. Nothing against GE Cafe, but it wasn’t a Monogram! I wanted my Monogram range back! I decided to do my “homework” on appliances again. I visited design centers, read reviews, read appliance specifications and checked pricing. I looked at Wolf, Viking and any range that had a griddle, grill and two ovens (one small and one large). I “needed” the small oven (for just my husband and myself for daily meals) and a griddle for LOTS of things (pancakes, bacon, quesadillas, tacos, vegetables, grilled cheese sandwiches and more). Once again, the Monogram 48″ range was the best choice. While visiting New York City, we decided to visit the Monogram Design Center and partake in a lunch prepared by the in-house chef. We saw and experienced the “wonders” of the Advantium oven and decided to buy one. This purchase eliminated the need for a warming oven and microwave, thus leaving more room for cabinets. 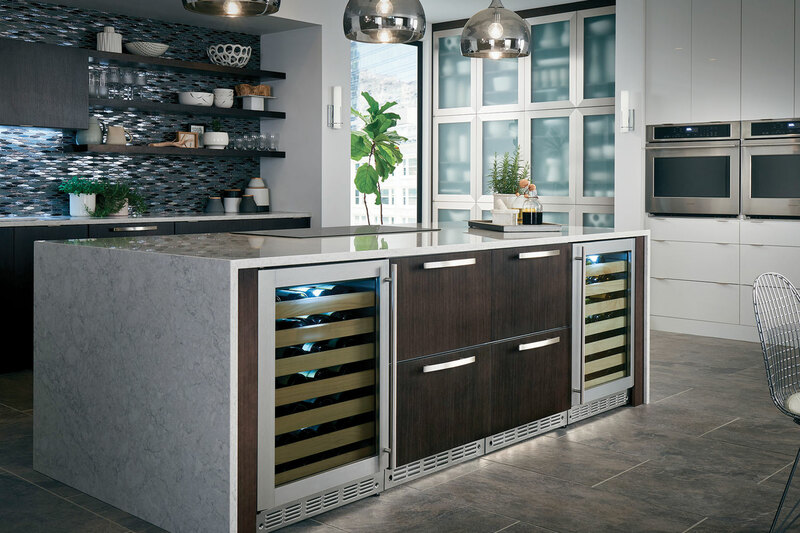 We ended up taking advantage of the “2 for 1” sale and bought the following Monogram appliances … 48″ range (grill & griddle), 48″ counter depth refrigerator with built-in water dispenser, dishwasher, wine reserve and the Advantium. Where applicable, all of the appliances will have custom panels, similar to the Oakland kitchen. My current kitchen has no appliances or cabinets. We’ve converted the dining room into a temporary kitchen. Demolition of the kitchen starts this coming Monday. Hopefully in 10 weeks I can share photos of our new Monogram kitchen. Christina Dragota, lead product specialist in the Monogram Design Center in Chicago, talked with homeowners Siobhan and Jody Young about their recent kitchen remodel, why they chose Monogram appliances, and what they learned during the process. Why did you decide to remodel your kitchen? We were very unhappy with the overall layout of our old kitchen. It was dated and very dysfunctional. We had large areas that were tremendous wastes of space. We also greatly disliked all of our white, outdated appliances. Tell us about your design process for the kitchen. Initially we went to a cabinet company to do our layout. Because of the strange shape of our kitchen it presented many challenges. Finally, my husband who is s structural engineer, decided to lay it out himself. We knew we wanted to maximize the space and wanted a design that was functional with our three kids. We needed storage, display area, and wanted to increase the value of our home with a gourmet kitchen. I knew I really wanted white somewhat traditional cabinets that would last the test of time. We knew that we wanted stainless steel appliances with an industrial look. Mostly we wanted a beautiful kitchen that would be the focal point of our very lived in home. We were attracted to Monogram appliances when we visited Chicago at Easter time. We went to the GE showroom and met with Christina who showed us the functional features and industrial gourmet look we wanted. I was most impressed with the induction cooktop especially with the speed and evenness of cooking. The Advantium oven was also another huge seller. I needed the bonus of additional oven and the functionality of a microwave and toaster all in one. My husband was sold on the 48” refrigerator, it was enormous and absolutely amazing looking. It became the focal point of our pantry wall very quickly! Which appliance are you most excited about? What would you have done differently with the remodel? In the remodel, the only thing I would have done differently would be to add a wine cooler to the pantry wall. We are avid wine drinkers but struggle with getting the perfect temperature in both reds and whites. Currently, we are undertaking a remodel in our laundry room (our final downstairs project) and are exploring adding a wine cooler in there. A Monogram cooler is on our wish list.